It is a light 1.5km run up a well-worn trail from the Lucas Reserve carpark. 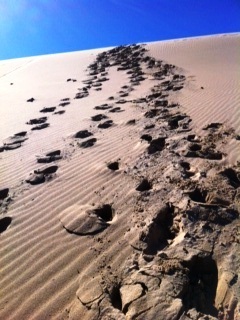 The mighty dunes stand with inclines from 45 degrees. 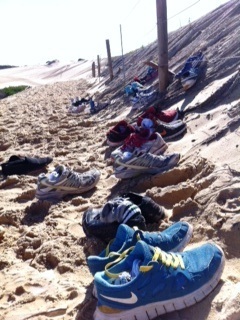 At the dunes, sneakers are left behind and lay side by side like at Footlocker. Get ready to feel your heart pump furiously. It is a gruelling yet highly beneficial workout. Runners are often seen scrambling on their hands and knees in the last few metres determined to reach the top of a hill. 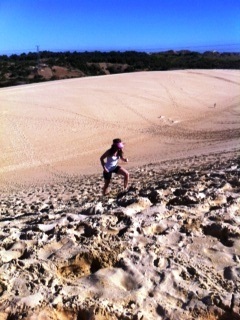 Running the Dunes is commonly known as 'a great hangover cure' amongst the locals. One of the wonderful things about the Dunes is that they get to be enjoyed at all times and by a myriad of people. The unique desert scape is an exquisite location. Its beauty is often maximised for other uses such as the set for Vogue modelling shoots, television commercials and also the odd movie such as Mad Max 3. Where: Bate Bay Road, Cronulla. I did this today. I thought I was going to die! But I lived to write this.